And you thought picking out the color was the hardest thing! 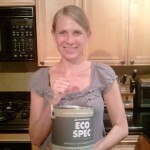 We settled on Benjamin Moore Eco Spec WB paint. It met most of my onerous qualifications, only lacking a Greenguard or Green Seal Certification. As an interior designer, my wife liked the fact that she could have the paint tinted any color. The painter (me) will like that it has similar properties and texture to more traditional latex paint. The cost was slightly over $30 a gallon. The premium is a small price to pay when you have two young children at home (and you happen to be the Indoor Air Nerd). Do you have any experience with specific paints that you can share with our readers? Please add a comment below. < Previous Increased mold levels coming? I took your course so maybe I should know this answer. About how long can you expect new carpet to “off gas”? I know that this question has tons of variables (i.e., low VOC carpet?, air exchanges in room?, etc.). My quest is for a more “rule of thumb” answer. I will state the question in another manner for clarity. Would you expect carpet installed 6-7 months ago still stink under normal environmental conditions? To make a long story short, I have elevated VOCs coming from the paint on my walls. While the paint is at least a year old, I suspect some visible touch-ups used bad paint after finding (and discarding) the cans stored in the unconditioned attic. My question is how can I eliminate VOCs from existing wall paint? Is it sufficient to paint over it with a zero VOC blend, such as your Benjamin Moore recommendation? Or should I do some sort of primer or treatment first? Not sure if you’ll see this, but here goes. We’re renovating after tornado damage. Generally using no/low VOC (Ben Moore) paint, water borne sealant, adhesives, etc. No carpets. No particle board. No flame retardants. Painter insists on using an oil based primer for some wood paneling only (~one wall) — voc is 350 g/L here. If it dries adequately prior to application of no VOC paint are we in the clear, more or less? Have a 7 month old. Supposed to move in about two weeks after application of said primer. I suspect you’ll still smell it 2 weeks later. I would try to find an alternative option. If there’s no other option, have the painter set up a plastic partition wall (containment around the painted wall) and exhaust as much of the air out of the containment with a large fan. Thanks for your quick response! One more question: We’re planning to get an air purifier to help mitigate lingering renovation dust etc. do you think the Austin air healthmate actually removes VOC or not really? Otherwise I have my eye on a different one. You should find an air cleaner that does HEPA filtration of your dust and granular activated carbon (10 pounds or more) for your VOCs.